You might not know a lot about Chinese New Year (also known as the Spring Festival), but, really, there aren&apos;t too many differences when you compare the biggest Chinese festival of the year to the biggest Western festival. In this piece, we look at some of the biggest differences and similarities to help you gain a better understanding. While Christmas is a religious holiday with connections to Christianity, commemorating the birth of Jesus Christ, the Chinese New Year celebration has links to agrarian society when the Chinese used to pray for success during the coming farming year. 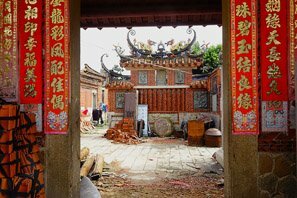 Later religious practices, like Buddhism and ancestor worship, also attached themselves to the Spring Festival. In a way, both festivals have similar origins as they both have roots in paganism, taking the earth&apos;s position relative to the sun into careful consideration. There&apos;s half a season&apos;s difference (on average) now. Yule celebrates "the return of the sun"; the Spring Festival celebrates the &apos;Start of Spring&apos;. Click to see the Origin and History of Chinese New Year. Legend (one that came after Chinese New Year came to be) has it that, during Chinese New Year, a monster named Nian (or year) used to go to the villages once a year to eat livestock and children, and that the only way to banish this monster was through red-colored objects and loud noises. This sheds some light on the traditions explained below. Click to read the Top 3 Chinese New Year Legends/Stories. Legends of Christmas are rather more friendly, with tales of the historical Saint Nicholas (Santa Claus) and the mythical embodiment of Christmas (Father Christmas) merging into one benevolent present-giver. Traditionally Chinese New Year lasts about two weeks in total, with the official holiday between February 4 to February 10 in 2019, with most people returning to work by February 11 (Monday). The Western Christmas holiday season is similar in length at approximately two weeks, from December 24 through January 6, although generally only schools get this entire period off. The reason for choosing December 25 as the actual date is unknown, although this was the date the Romans marked as the winter solstice. 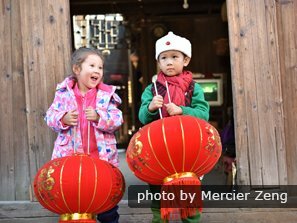 One of the main differences in dates for the two celebrations is that in China the dates change every year (within the period January 21 to February 20) in accordance with the lunar calendar, and the first seven days are always public holidays (from CNY&apos;s Eve). Christmas is generally seen as a Christian holiday (even though the original mid-winter Yule celebration predated Christianity by thousands of years). The typical rite is to attend mass or some form of carol service to remember Christ&apos;s birth. The Chinese New Year is welcomed with lion and dragon dances (among many other things listed below) in a parade through the streets. 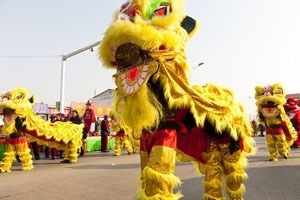 The lions and dragons are typically acrobats in colorful costumes as depicted. The dances are loud in the aim to push away evil spirits and bring in prosperity and luck for the year ahead. Another tradition that is common in China, that you don&apos;t find as much during the Christmas season, is the buying and wearing of new clothes especially for Chinese New Year, and getting rid of the old. 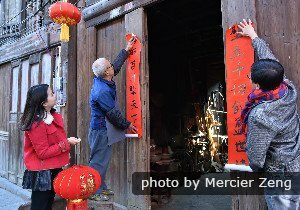 The idea of new beginnings is really important during the Spring Festival. During Christmas in the West, although these traditions vary wildly whether you&apos;re in North America or in Europe, and even within Europe, typical food includes turkey, nuts, sweets, and cakes. In general hours are spent around the dining table eating lots and drinking with family and friends. In China, the foods popular during Chinese New Year are popular because of the symbolic meaning of their name or appearance. For example, fish is always present during Chinese New Year meals because the Chinese word for fish, yu, has the same sound as the Chinese word for abundance. As a result, Chinese people believe that eating fish during this period means you will be prosperous in the new year. 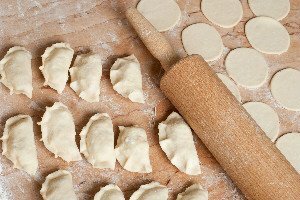 Another common item is dumplings, or jiaozi, shaped to look like ancient Chinese coins representing wealth and prosperity. These are usually stuffed with meat and vegetables with specific stuffings ranging across the country. 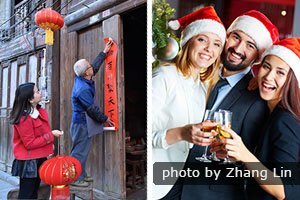 As for meal timings, Christmas sees its main meal at lunchtime of Christmas Day, while in China the main meal takes place in the evening of Chinese New Year&apos;s Eve. In the West, toys are more common presents for children (given to them by Santa Claus). Between adults, presents are more likely to be food or drink related, or money amongst close relatives. 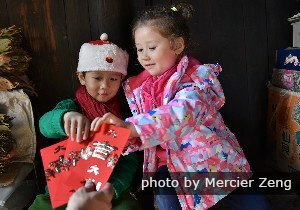 During Chinese New Year, however, the most common present is the red envelope filled with money, or hongbao. These are given to children by adults. Amongst each other, adults will exchange fruit baskets, sweets, alcohol, tea, and other items like that. We&apos;ve compiled a list of gifts to give at Chinese New Year here. Green, red, and gold are the most common Christmas colors in the West, adorning the streets, houses, and shop fronts. In China, red and gold are also the most typical colors, representing prosperity and happiness. 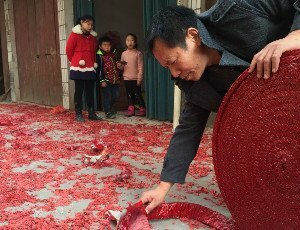 You&apos;ll also see these colors across houses and streets, with Chinese New Year&apos;s decorations made of red paper and thread as seen in the picture on the side. 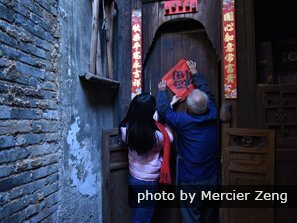 Chinese households will put up couplets with good wishes or statements, paper cuttings, and images in relation to the Chinese zodiac. Flowers also represent Chinese New Year festivities. While in the West we put up Christmas trees during the Christmas season, in China kumquat trees can be found because the Chinese word for kumquat contains the word for &apos;gold&apos;, representing wealth. 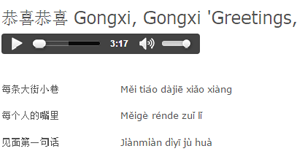 The atmosphere, and the noise levels, definitely differs between Christmas and Chinese New Year. While firecrackers and fireworks are set off to be as loud as possible in China in order to scare away the above mentioned Nian monster, during Christmas the atmosphere is generally calmer, with church bells and Christmas carols taking a quiet approach to festivities. 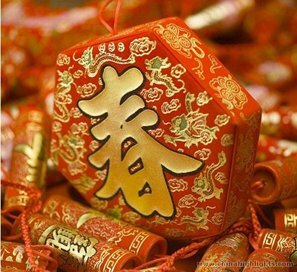 Click to see Why Chinese New Year Must Have Firecrackers. Christmas in the West generally sees no fireworks, although New Year&apos;s Eve does. Even then, however, the focus is on aesthetically pleasing fireworks in the West, whereas Chinese New Year fireworks are aiming to be as loud as possible rather than as beautiful as possible. Family togetherness is important during Chinese New Year. And finally, a huge similarity lies in the importance of kinship. 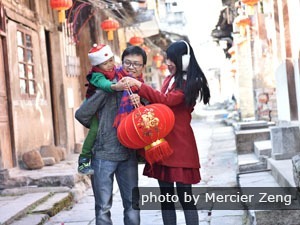 In both Chinese and Western cultures, the importance of being with family takes a central role during celebrations, and traveling home is an important part of this. The only difference here is that going home during Chinese New Year is so important for Chinese people that this time of year is also known to be the biggest human migration. Millions leave the cities on trains, planes, and buses to get to their families in the countryside. Also, both of these celebrations are a way to make the long, cold winter seem less daunting, providing hope at the end of the tunnel, these days also with a new commercial twist. Want to Visit China During Chinese New Year? 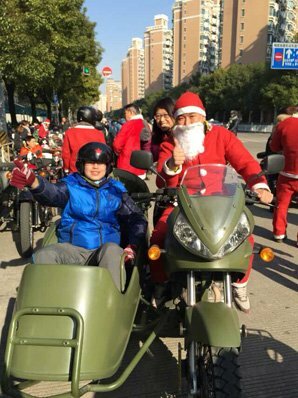 Our Beijing guide makes this Christmas sidecar tour of Beijing special. We&apos;ve got plenty of tours going around Chinese New Year, whether you already know what you want to see, want to experience the celebrations in the capital, or are only just starting to research your first trip to China. We have even compiled a list of the four best cities to visit for Chinese New Year 2019.